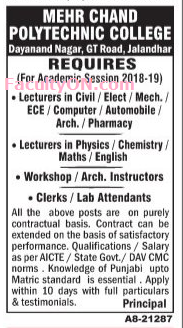 Mehr Chand Polytechnic College, Jalandhar has advertised in Tribune for the recruitment of Lecturers jobs vacancies. Interested and eligible job aspirants are requested to apply with in 10 days. Check out further more details below. College Profile: Best Polytechnic Award” Presented by NITTTR(National Institute of Technical Teachers Traning And Research) Chandigarh on the occasion of Golden Jubilee Celebrations of the Institute on September 07,2017 to Mehr Chand Polytechnic College Jalandhar(Punjab) for having been adjudged as one of the outstanding polytechnics in the Northern Region for the Year 2016-2017.